10 Things You Didn't Know About "The Code"
CBS has recently welcomed a new series to their network lineup. 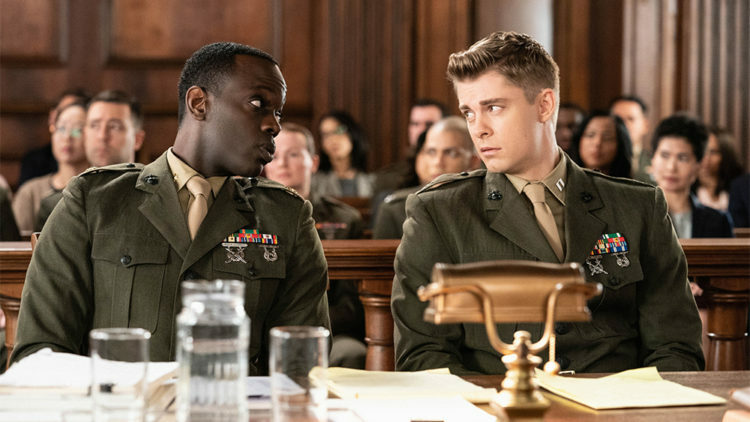 “The Code” is a procedural drama in the military/legal genre and it made its premiere on April 9th of 2019. It’s a brand new series and reviews are still coming in so we’re not yet sure how things are going to shake out in the ratings department. If you haven’t yet heard about it, you’re in the right place. Here are 10 things that you probably didn’t know about the new drama. There has only been one episode aired so far so it’s too early to tell if the new series is going to catch on. If the initial ratings are any indication, the reviews so far have been mixed. According to Rotten Tomatoes, there is only a 40 percent approval rating, but the good thing about it is that there had only been five reviews posted as of that time, so there’s still room for improvement in the ratings. If you’re into courtroom dramas then you’ll probably love this new show. The main characters form a team of America’s best military legal team and the group consists of a defense lawyer, a Marine and an investigator who are all trained to take on the toughest and most challenging cases (This is the basic premise of the show and as of now, it’s hard to tell which direction the writers will take the story. The show is still in its infancy and if the writers see that the stories are not quite hitting in the right places with the audience, perhaps we’ll see some amazing character development to turn things around. It’s good to know what you’re getting into before you tune in because from all appearances, “The Code” is a very intense drama. It deals with a marine who was stationed in Afghanistan. He’s in need of strong defense because he killed his commanding officer and has been brought up on some very serious charges. Delaney has been cast in “The Code” in the role of Colones Elsa Turnbull, who is a Marine Corps Judge Advocate and she ranks very high. It’s not the type of character that she has typically played in the past, although she is a seasoned actor and has decades of successes to her credit. This is a first for her when it comes to playing a lawyer but she shared in an interview with AARP that at the age of 63, she is up to the challenge of taking on a different kind of role. “The Code” is a show that features Dana Delaney in a prime role but it also brings in some new talent in key roles. Anna Wood plays the part of Captain Maya Dobbins. She is joined by Phillipa Soo in the role of Lieutenant Harper Li and Luke Mitchell playing the part of Captain John Abraham. If you haven’t yet heard of the latter three actors, it’s okay because this is your chance to get to know them all a bit better. CBS has scheduled “The Code” for the Monday night time slot at 9 pm beginning on April 15th. The first episode was aired on a Tuesday, but it was a special event. If you caught the first episode and you want to make this a regular thing then don’t wait until the next Tuesday to look for it or you’ll come up a day short and one episode behind. CBS maintains an official site for the new drama “The Code.” One of the best things about the site is that it gives viewers access to episodes which have already shown and you can view them there. If you’re just hearing about the new show and you missed the premiere, you’ll be able to see it in its entirety so you’re ready to go for the second episode. As of the first showing, the new drama created by Craig Turk and Craig Sweeny hasn’t provided a lot of dazzle to give it an ultra dynamic debut. It hasn’t been deemed a flop by any standards, but reviews show that the audience isn’t getting anything that special from watching it so far, according to Forbes. This is the type of drama that appeals to those who love procedural dramas. It’s not going to be every body’s first choice but there is a niche audience out there who will no doubt find some things about it that they appreciate. On the plus side, even if you just watch a few clips from the new series, “The Code,” you’ll find that it does have a certain aesthetic appeal. All of the actors are very attractive and they carry themselves well. This is one aspect of the show that is an important element, but we didn’t see it mentioned in any of the reviews. You can catch a glimpse here. The setting is very military and for quite a few viewers, it will offer a sense of familiarity as well. We were looking through the reviews which were posted about “The Code” episode 1 and on Rotten Tomatoes, there were only five responses. While we realize that the critics carry a lot of weight when it comes to ratings, the show hasn’t had enough time to unfold yet. It could still become one of the most popular series on television if it turns the corner in the right directions and ups the excitement and drama a bit. We’ll have to wait and see what happens, but it’s still a show that is worth checking out.